This is one of those builds that had a strong original idea but ended up something rather different. 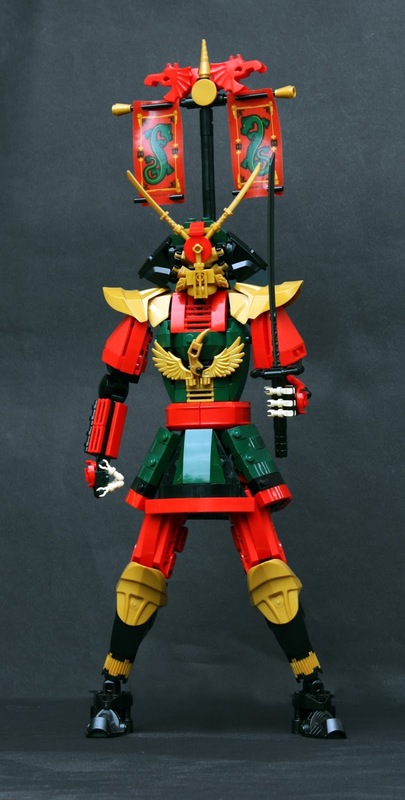 The idea was similar than on Kira; to adapt well-designed minifig torso to a larger build. 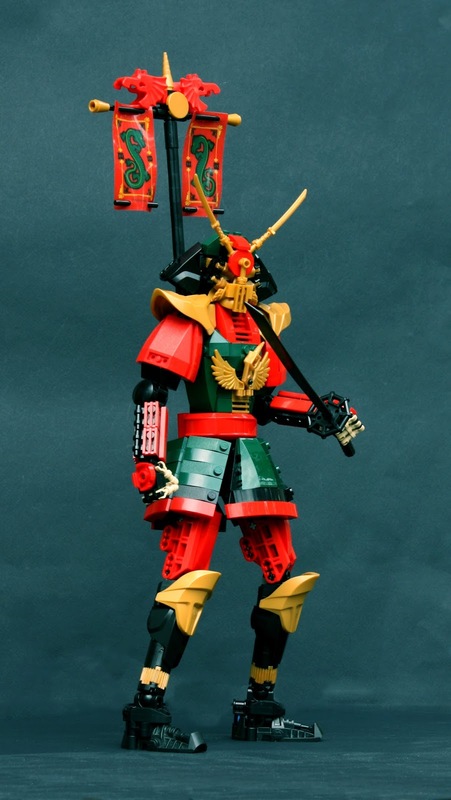 Accidentally this torso was from same character, Samurai X from Ninjago (this time the 2015 version). I intended the scale to be similar than on Kira, but it ended up being somewhat smaller, around the scale of Mace-bearer and Cyira the Paladin. The colors were one of the main points here. 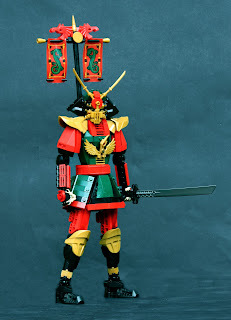 Samurai armors have often dashing but earthly colors, opposed to (popular culture imaginary of) European knight armors, which usually seem to be silvery or grey. The colors are naturally based on the minifig torso, as is the bird emblem in the breastplate, but it was generally interesting to match the bright red and pearl gold parts with more toned-down ones. 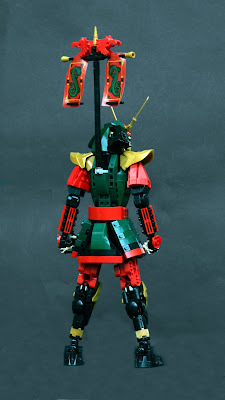 This MOC also had an interesting blend of old typical techniques and some new experiments. The upper torso is pretty basic, with curved wedges on the sides and CBBS armors on the shoulders. The skirt, however, was challenging. I had several different versions, but ended up with this one with 90 degree angles on the side panels. It's very thigh, but allows some movement to the upper legs, which again are very basic type with roborider halves. The bulky upper arms were another part were I tried to create a distinct profile. 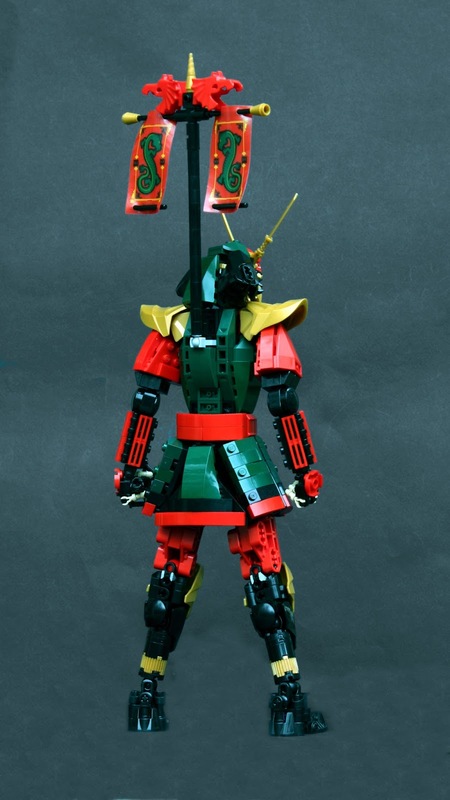 The helmet was a challenge, but also a joy to build. 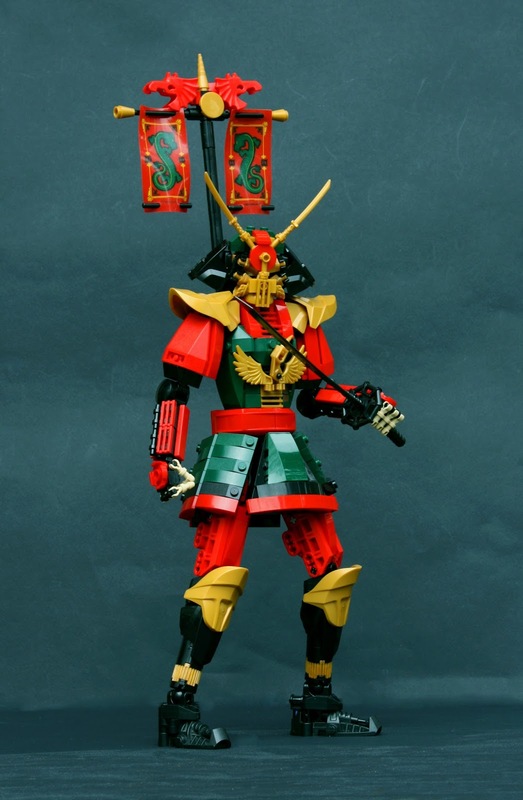 I definitely wanted to have a mask to hide the samurai's true identity and gender. I googled for samurai armors and was fascinated by cool yet scary mask which often had facial hair (carved or actual) on them. 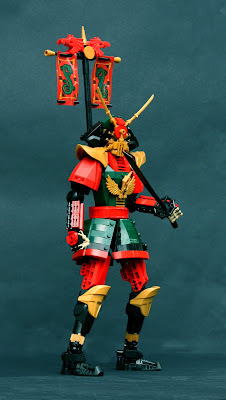 Somehow I ended up using CMF Winged Warrior's shoulder armor. I tried using it both two and one stud sides on front, but eventually ended up with the side with the neck guard as lower jaw. The helmet actually got remade just before photographing: the joint was actually on the back of the helmet, as I couldn't fit it into the middle of it. It looked awfully bad on most angles, so I fiddled with for an hour or something, until I made it fit; Used some of those new-ish 1x1 round tiles with bar and plume hole. There's even four TECHNIC cams in it to connect the CBBS armor pieces. 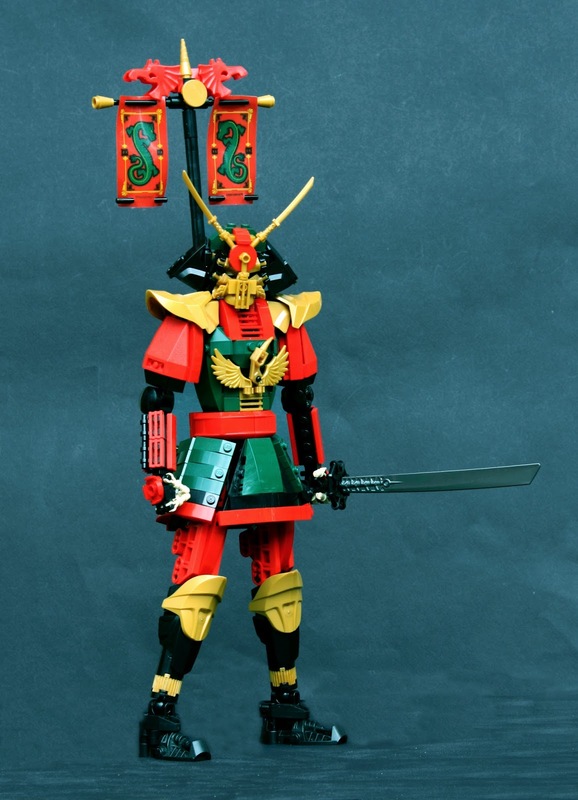 The katana is a basic one, with Ninjago blade and a simple handle. The flagpole was a late addition: I had thought about it, but wasn't sure if it needed one or not. I ended up building it anyway. Those masts are just pretty cool overall, and the flags from Orient Expedition's Dragon Fortress were just perfect. My name is Eero "Pate-keetongu" Okkonen and I'm a 1995 born AFOL from eastern Finland, the land of northern lights. I currently live in Tampere, the biggest inland city in Nordic Countries and study architecture in TUT (or TTY), Tampere University of Technology. 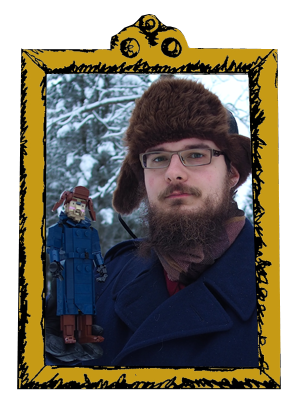 This blog is about my adventures and experiences with LEGO bricks, the world's best toy and art medium. I mostly blog about my own MOCs, WIPs and purist minifigures, but you can also find some exhibition reports and other articles about bricks and LEGO community. The other guys who have helped with this blog are Crudelis "Manfred" Diabolus, the master of codes and scripts, and Don Valentino "Don" Delucci, the master of art and maker of the banners. Big hand to you, guys. Copyright (c) 2011— Cyclopic Bricks. Original Blogger Template (Nautica) by DeluxeTemplates — redesigned by Crudelis Diabolus & Eero Okkonen.